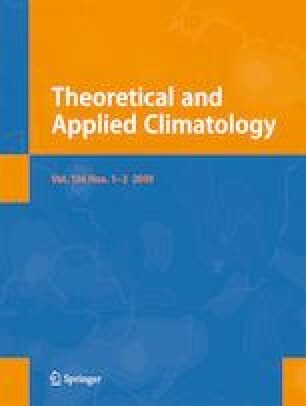 This paper investigates the linkage between large-scale atmospheric circulation and monthly precipitation during November to April over Iran. Canonical correlation analysis (CCA) is used to set up the statistical linkage between the 850 hPa geopotential height large-scale circulation and monthly precipitation over Iran for the period 1968–2010. The monthly precipitation dataset for 50 synoptic stations distributed in different climate regions of Iran is considered as the response variable in the CCA. The monthly geopotential height reanalysis dataset over an area between 10° N and 60° N and from 20° E to 80° E is utilized as the explanatory variable in the CCA. Principal component analysis (PCA) as a pre-filter is used for data reduction for both explanatory and response variables before applying CCA. The optimal number of principal components and canonical variables to be retained in the CCA equations is determined using the highest average cross-validated Kendall’s tau value. The 850 hPa geopotential height pattern over the Red Sea, Saudi Arabia, and Persian Gulf is found to be the major pattern related to Iranian monthly precipitation. The Pearson correlation between the area averaged of the observed and predicted precipitation over the study area for Jan, Feb, March, April, November, and December months are statistically significant at the 5% significance level and are 0.78, 0.80, 0.82, 0.74, 0.79, and 0.61, respectively. The relative operating characteristic (ROC) indicates that the highest scores for the above- and below-normal precipitation categories are, respectively, for February and April and the lowest scores found for December. The authors greatly appreciate the anonymous reviewer for the helpful comments. The authors thank the NCEP-NCAR and IRIMO for the data.